You can improve your vision at night if you have a flashlight. But holding both flashlight and handgun can be bulky and difficult to move around. 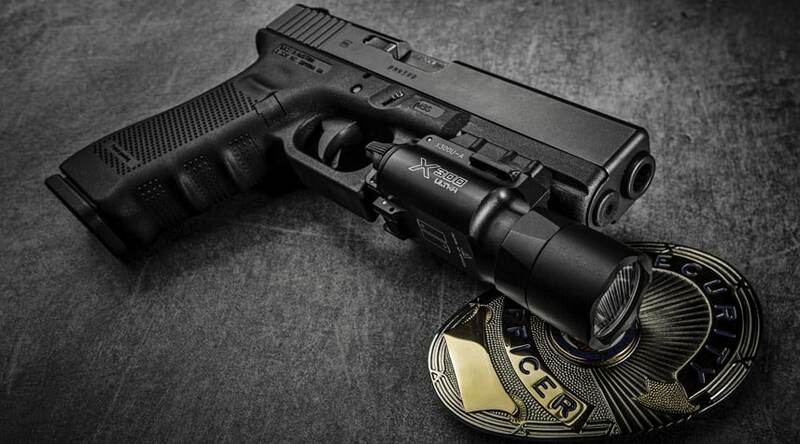 Fortunately, some lights can be mounted on the rails of handguns, and these are called pistol or weapon lights. For the best pistol light and how to choose one correctly, you can depend on this article to give you what you need. Are you in a dilemma whether to use your old handheld flashlight or just buy a weapon light? There are pros and cons to both things. 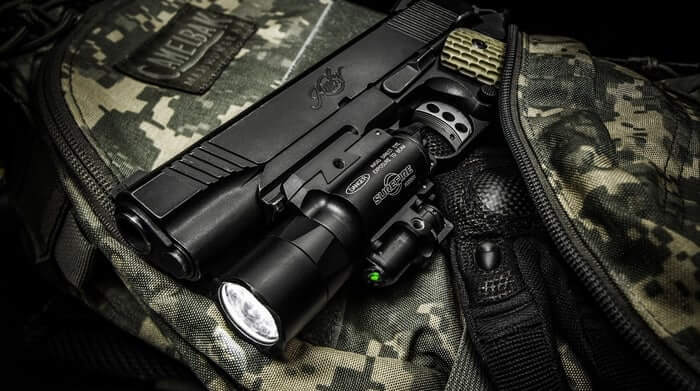 First and foremost, the pistol or weapon light is compact and convenient to carry around because you just have to carry one thing, which is your gun. Then, when you flashed on something threatening, you have them immediately at gunpoint. A standard handheld flashlight can be used as a backup when the pistol light fails. It’s good to be ready in different and unexpected situations. For its cons, one example is its bulkiness. Choosing pistol lights is not easy. You have to consider the weight, size, price, among many other factors. This pistol light has a mount that has its flashlight on one side rather than below the barrel. This is easier to access because the switch is near the thumb. This pistol light has a capability of quick attach and detach of the light to the rail of the gun. It is not done in a sliding motion. This is a type of weapon light that has a laser pointer and suitable for people who prioritizes self-defense. There are two types of rail systems that most handguns have. 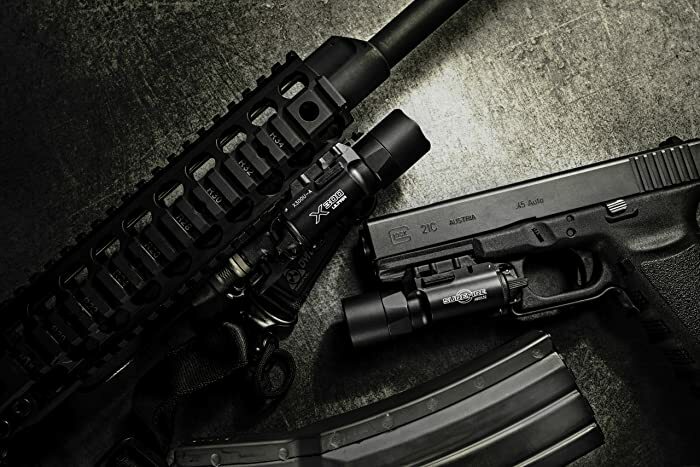 Most guns of today have specially designed rails found at the bottom of the barrel for attachment of accessories like pistol lights, lasers, and even bayonets. This rail system is also called tactical rail and can only mean that it’s used on many handguns. The bracket has a standard mounting interface that has rails and multiple transverse slots. Its difference from the Weaver rail is based on the low wide dovetail, as the Picatinny rail has more pronounced angular section. Picatinny rail is designed to mount heavier accessories with no problems. The difference it has over the Picatinny rail are the rounder slots. While you can mount the pistol light on a Picatinny rail that is designed originally for the Weaver rail, the opposite can’t be possible. This is because the Picatinny rail has rectangular slots. Some weapon lights of today can cater both Picatinny rails and Weaver rails. We call them universal rails. The weight of the weapon light generally depends on two things: the construction material used and the number of batteries used. The weight is an important factor to consider because the weapon light is located at the bottom of the gun. If the light is on the heavier side, it will result in the gun being heavier on the front part. There’s a chance that it will tip downward and can affect your user experience. For every flashlight, brightness is the main factor to consider. For most tactical flashlights, they have lumens higher than 400. Lumens is the measuring unit for the brightness output of the beam. However, the number depends on the number of batteries used. If it’s only one, then the light output is obviously lower than when using two batteries. The distance the light can reach will also depend on the brightness. Most handheld flashlights are powered by AA batteries. But for weapon lights that you use in more proactive situations, CR123A batteries are more preferred. That’s because the CR123A lithium batteries have a longer life and offer higher voltages compared to AA batteries. Even though lithium batteries are more expensive compared to alkaline, you can guarantee that they can give you an utmost performance. A lithium battery has longer runtime as one CR123A battery has 1500 mAh (which doubles the capacity of an AA battery). Not all pistol lights have this feature, and those that have laser options are priced higher. Lasers are advantageous to those people who prioritize self-defense or law enforcement duties. They can help you aim better and use when shooting at nontraditional or odd angles. They are easy to use and helps you see in low light situations. Most pistol lights that have laser functions use either red or green lasers. There are pros and cons for each color, but one thing to be observed is that the green laser is always priced higher than red lasers. Green lasers have higher visibility at daylight, but red lasers have little to no visibility at the same duration. Red lasers, however, are easy to spot at low light conditions. Red or green, the choice is upon you. Lasers attached to the lights have separate windage and elevation adjustments that you can freely adjust to align your target point. 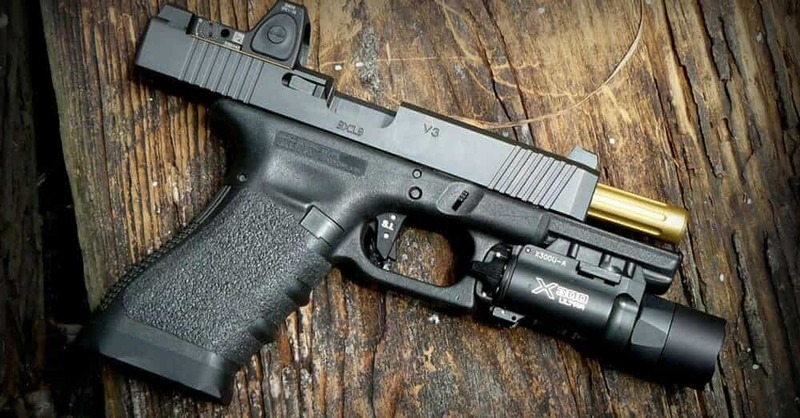 In this article, we listed the best pistol lights that you can buy right away. Be sure to check them out. Want to hold both flashlight and handgun in just one hand? 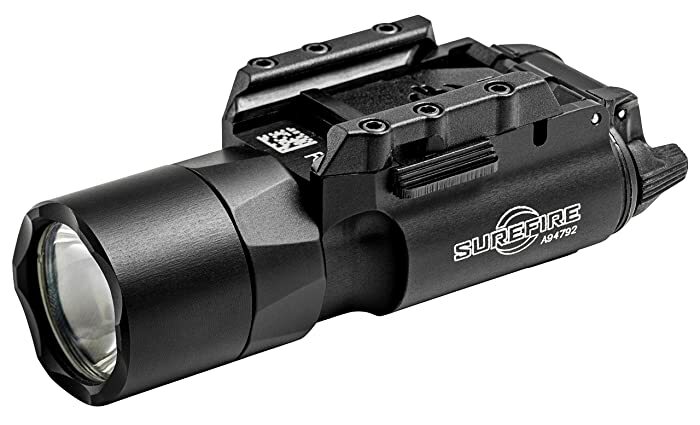 SureFire brings you their very own weapon light that is not difficult to mount. Like other LED lights by SureFire, you can expect the best quality and maximum brightness you can use to your advantage when in tactical or emergency situations. SureFire X300 uses the high-strength aerospace aluminum as its housing. Its durability is guaranteed because of the Military Specification (or Mil-Spec) for anodic coatings. To make the flashlight weatherproof, the O-ring and the gasket are both sealed. This pistol light is easy to mount on most handguns and long guns that have Picatinny rail or Universal rails. The system SureFire uses for X300 is called Rail-Lock Mounting System. This is a T-slot mounting system that comes with a tightening screw and T-slot mounting rail. You can also mount X300 on most rail-less handguns because there are available MR adapter mounts that can be purchased separately. The LED that has a capacity of delivering 500 lumens is considered to be virtually indestructible. That said, the gun’s recoil will not affect the structure of the LED. Furthermore, the brightness of 500 lumens, which can temporarily blind the someone’s vision, is generated by an intense white light. The beam is focused thanks to the TIR lens or also called Total Internal Reflection lens that maintains ideal situational awareness. Under normal circumstances, the light can reach more than 100 meters ahead. As for turning on the flashlight, you can easily do it with just a finger with the ambidextrous switch. It is located at the rear of the device. It has the functions of on/off by flipping up/down, and also momentary on activation that you can access by flipping sideways. X300 is a great product, but any product has their setbacks. For this one, though, it’s only minimal. The 500-lumen brightness is observed to be too bright and can impair the vision of anybody who is focused on by the light. There are no brightness levels that you can toggle to minimize the light output. Another thing is the temperature. The flashlight gets hot very fast because it uses the maximum brightness setting every single time. SureFire X300 is powered by two 123A lithium batteries supplied by SureFire. These batteries have a ten-year shelf life and can withstand high temperatures. They can never fail due to short-circuiting problems because of their construction inside. This tactical flashlight might be what you are looking for to go with your handgun when searching in a dark room or on a night while doing sentinel duty. TLR-1 by Streamlight delivers you the maximum brightness you can ever wish for as you can light up an area 245 meters(max) ahead. Its convenience and light output are its main selling points. For the housing of this pistol light, Streamlight used a machined aluminum material with anodized finish. It can support the flashlight well with its waterproof rating of IPX7, and can still function after being submerged for about 1 meter in 30 minutes. The rail grip clamp system of TLR-1 allows the user to attach and detach the light with no tools required quickly. It can cater most handguns with Picatinny rails and Glock-style rails. TLR-1 also has keys for Glock-style, Picatinny, Beretta 90two, Smith & Wesson 99 and TSW. Your safety is also secured as you attach/detach the light because of the mount interface that keeps the hand away from the muzzle. TLR-1 utilizes C4 LED technology which has a lifespan of about 50000 hours. It is also shockproof to which the LED won’t be affected with the recoil of the gun. The brightness this light gives off is very powerful at 800 lumens and bright enough to reach long distances. The beam is concentrated for a brighter focus due to the TIR lens. Though this flashlight can flash beam at 800 lumens, you will need to be careful where you aim it. It is at most two times brighter than most weapon lights and can impair the eye vision of anybody you direct this LED light on. It’s not unusual that this weapon light will get hot quickly due to its light output. We observed that the strobe function of TLR-1 can be tricky to activate especially in emergencies. Activating it takes two flips to the left of the switch and should be held to keep it on. And then, to make it constant on in strobe mode, you need to flip the switch twice to the left and then rapidly flip to the right. This is an arduous process and can be improved with just one switch next time. One good thing for this flashlight is its strobe function that can be enabled/disabled depending on your choice. The strobe is useful when sending out emergency signals. It can be accessed along with the on/off function and momentary on activation through the switch located at the rear. Like most weapon lights, the switch is ambidextrous to cater both left-handed and right-handed shooters. This light can work with a remote switch, and it’s sold separately. But the pistol light can work perfectly fine without the need of a remote. Streamlight TLR-1 is powered by two CR123A lithium batteries that have a 10-year life span. They are included upon purchase of this light. 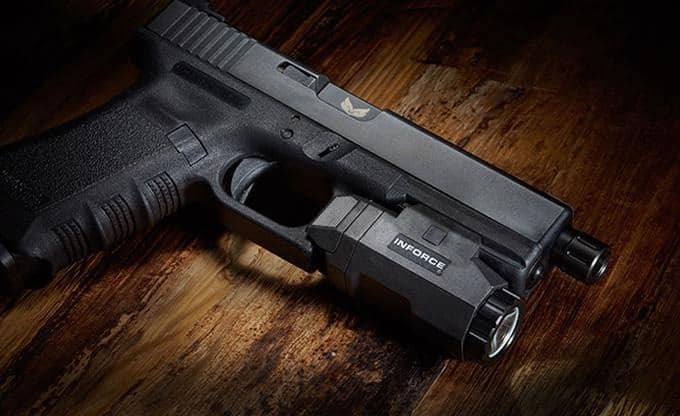 This is one of the lightest pistol lights you can attach on your handgun. The weight is an important factor to consider as you don’t want the gun to tip downward. This pistol light weighs only 2.83 oz. Its weight stems from the number of batteries used – which is only one. Another factor why it’s lightweight is the semi-polymer construction. The exterior of InForce APL is made of both polymer and metal. APL only has metallic parts on the bezel housing, at the top where screws are located, and the bezel itself. Also, APL is said to be waterproof and will still function after being dropped to water with a depth of 66 feet (20 meters). As for the mounting system, it’s quite easy to attach as the lever on the left side is smooth and will tightly lock down to the rail. A great advantage of the system is that you don’t have to slide the pistol light from the front, which makes you secure. Safety is APL’s priority because your hand will be away from the muzzle during the mounting. InForce APL is compatible with most handguns that have Universal or Picatinny rails. The LED of APL can only provide 200 lumens as its maximum brightness. However, that is plenty enough for a single battery-powered light. The beam it provides is broad which can span a wider area. You can activate the light by the large paddle switches located at the rear of the product. To turn it on, push one of the paddles downward. One good thing for this light is you can choose between constant and momentary on functions. If you want constant light for easy searching, just tap the switch quickly just like when turning it on/off. For momentary on function, hold down the switch, and it will stay on until you let go. Though APL is a good light, you don’t want to use it for heavy duty tasks due to the polymer construction. Using it in tactical situations where there would be potential contact with hard surfaces may not be suitable for this flashlight. APL comes in two colors: black and brown to suit the color of the pistol. 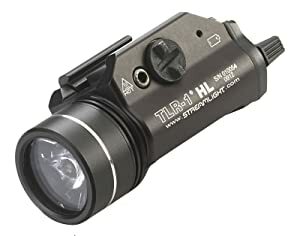 Streamlight TLR-2 is the updated version of TLR-2 with the first obvious difference on the red laser the TLR-2 can produce. 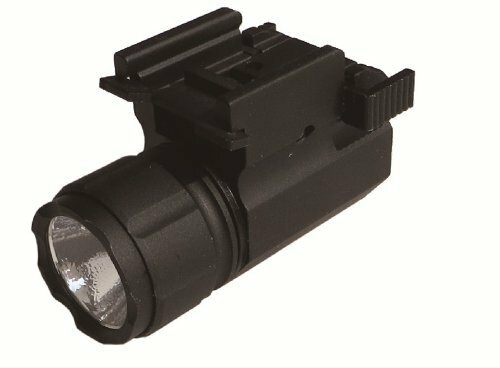 This weapon light is perfect for tactical situations and in low light conditions because not only you can temporarily impair the enemy’s vision with 800-lumens light, but you can make calculated aim with the help of the laser. The exterior of TLR-2 is made of aircraft-grade anodized aluminum that is water resistant with the IPX4 rating. The bezel part encompasses the Borofloat glass window which covers the TIR optic lens that gives out the concentrated and focused beam most of us like. The rail mount of this light is found on the left side and the spring-loaded system at the right. To attach it to your gun rail, just unscrew the screw found on the left and push it to extend the spring-loaded side. To cater most guns, you need to change adapter keys or mounts. To do that, just remove the hex screw at the left side and then the rail key. Insert a spare hex nut into the new rail key, then the new adapter key. TLR-2 uses C4 LED technology like TLR-1. This, in turn, results in same brightness capacity and runtime due to the LED and the number of batteries used. It is impervious to impact or shock and has a lifespan of 50000 hours. Furthermore, the TIR lens produces a focused beam but with a wide spill area so you can see brighter surroundings unlike when you use a reflector. 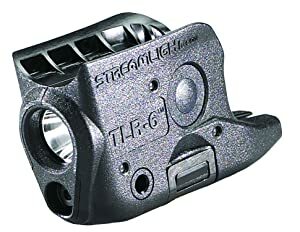 Streamlight TLR-2 uses a toggle switch that operates horizontally. There are three modes that you can toggle: main beam, main beam with a laser, and laser mode. The main beam can be chosen either in constant mode or momentary on. There’s also a strobe mode that can be accessed by double-tapping the main beam switch. The second activation switch consists of a two-directional paddle which is ambidextrous for a more comfortable feel. If you push it down on one side, the other side will be pushed upward. To activate the constant on function, press down to the right. Also, pushing the paddle down on the left activates momentary on function. As for the main beam with laser mode, the main beam is too bright that it overcomes the laser. Because of that, the main beam plus laser mode is no different from the main beam mode. The red laser when used in daylight has little visibility compared to green lasers. When used at nightfall, however, it has excellent visibility. TLR-2 uses two CR123A lithium batteries can light up the LED up to the max runtime of 1.5 hours. However, if you stick with the laser mode for the entire operation, the battery can last up to 48 hours. 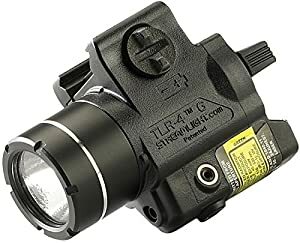 TLR-4 by Streamlight is one of the smallest and lightest weapon lights you can find on the market. Its weight won’t make the gun tip downward, and this is a respectable tool to use in tactical situations. You can toggle to only laser mode so you can sight the target with pinpoint accuracy. The pistol light features a heavy duty polymer construction that is both lightweight and solidly built. It is observed that there the inside is very solid and no rattling sounds. The polymer is durable enough to withstand recoil whenever the gun is fired. It can also resist water because of the IPX4 rating. Finally, there are still metallic parts at the important portion of the light to be resistant from unexpected impacts. You can expect easy mounting with TLR-4 for most handguns with Picatinny rails. In fact, TLR-4 is perfectly designed for sub-compact handguns because of its size. The rail clamps help to attach and detach faster using one hand. The design of the clamp keeps the hand away from the muzzle for a safer experience. With C4 LED technology, the light has a maximum brightness of 125 lumens with a runtime of 1.5 hours. Both brightness and runtime are dependent on the single lithium battery. In addition, this pistol light projects concentrated beam thanks to the textured parabolic reflector that provides optimum peripheral illumination. With just 125 lumens, it could be a setback depending on the situation. 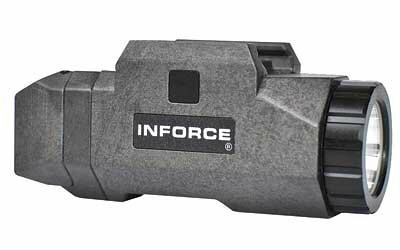 Compared to InForce APL that uses the same battery, TLR-4 has lesser lumens, but it’s a little bit higher in price. The laser diode projects a red laser that has a runtime of 11 hours. Both the white light and laser can be accessed through the toggle switch located at the rear on top of the two-directional paddle switch. The toggle switch consists of three modes: white light only, laser only, and both white light and laser at the same time. As for the second switch, the paddle controls whether the white light will be constant on or momentarily on. It is ambidextrous and easy to handle. Like most lights that have laser function, TLR-4 also has windage and elevation adjustments so you can freely adjust the laser sight. 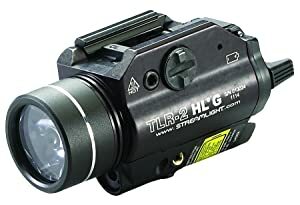 TLR-2G’s difference with the TLR-2 is just the color of the laser. For this model, it projects green laser. Green lasers are better than red lasers in reach. Thus, TLR-2G is a weapon light that you can use even in broad daylight. The laser only function can last up to 17 hours. Another thing to remember about the green laser is its 510-530nm direct drive. The housing of the light is made of a high-strength aluminum alloy that has a waterproof rating of IPX4. It’s also impact-resistant so you can expect this to last for a long time. The mounting system is not different with the TLR-2 that uses a red laser. This model can support most handguns that have Picatinny rails. Like in TLR-2, this weapon light also uses C4 LED technology which has a maximum lifespan of 50000 hours. It has a durable construction and so it can withstand the recoil of the gun whenever a bullet shoots away. The light is concentrated at the center but still, has a wide spill area due to the TIR lens. The beam at a maximum brightness of 800 lumens could be too bright and can temporarily impair someone’s vision. Be careful on who you direct this flashlight at. Another thing is that the temperature can rise quickly and the body can be very warm to touch. Activating the light is through the toggle switch which controls three modes: main beam, laser only, and laser plus main beam mode. There’s also a two-directional paddle switch located below the toggle switch to choose either the constant on or momentary on functions. Lastly, the strobe function can be accessed by double-tapping the switch. TLR-2 G is powered by two lithium batteries that have a storage life of about ten years. As for the main beam with laser mode, the main beam is too bright that overcomes the laser. Because of that, the main beam plus laser mode is no different from the main beam mode. Pistol lights that use green laser output are more advantageous compared to red laser output as the latter can’t be visible when in use at broad daylight. However, green lasers cost more. Green lasers are also temperature sensitive and can function well at a specified operating temperature. TLR-4G has no difference in specs with the TLR-4 aside from the lowered lumens, intensity, and the laser output. The “G” in the TLR-4G stands for the color of laser which is green. Green is highly preferred by people who use the gun more at daylight as green lasers offer high visibility at 510-530 nm direct drive. The exterior of this version is no different from the TLR-4 that projects red laser. Even though it is almost entirely made of durable polymer, the pistol light can withstand recoil and resists water well. 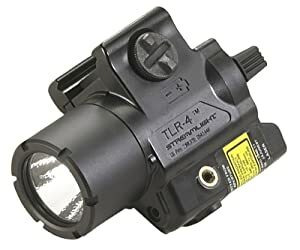 The material used is the main reason why TLR-4G is considered as one of the lightest weapon lights that can be mounted on most handguns with Picatinny rails. Like TLR-4, this model is OK in sub-compact handguns due to its size. The rail key or rail clamp accept different adapter mounts that make it easy to mount this to any gun with a rail. The clamp design is also a safety feature as it keeps your hand away from the muzzle when attaching or detaching. TLR-4G uses C4 LED technology and can project a light beam at 115 lumens at a runtime of 1.5 hours. The lumens of the light is reliant on the single lithium battery that is included upon purchase. The beam light projected is a concentrated focus and it’s caused by the textured parabolic reflector which provides optimum peripheral illumination. Compared to InForce APL that uses the same battery, TLR-4G provides lesser lumens, and it’s a little bit higher in price. The laser output that has a runtime of 11 hours. Both the white light and laser can be accessed through the toggle switch located at the rear on top of the two-directional paddle switch. The toggle switch has three modes: white light only, laser only, and both white light and laser at the same time. 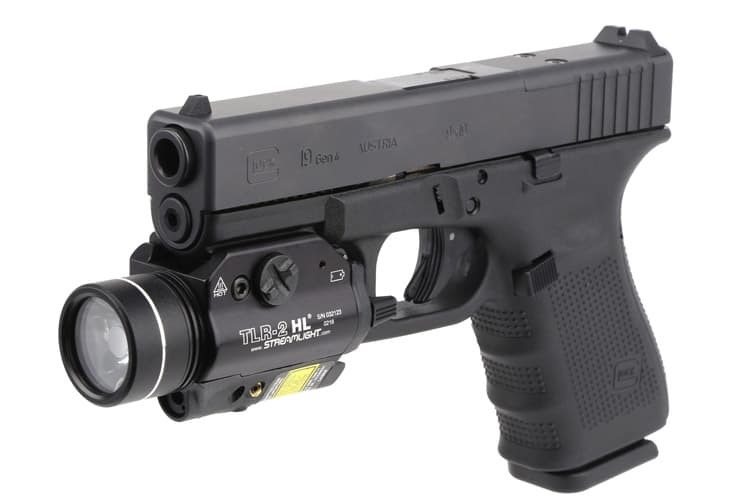 TLR-6 is probably the lightest and smallest pistol light that you can find on the market. Due to its physical attributes, TLR-6 is best used for the smallest guns that are purely designed for self-defense. TLR-6 can cater on most sub-compact handguns. It has six different housings good for 18+ handgun models. This weapon light is of polymer construction and resistant to impact for about 1 meter. Water resistance of TLR-6 has a rating of IPX4. Mounting TLR-6 is easy on your gun that has Picatinny rail. The pistol light can be split down at the center, and both sides are secured together by screws. To install it, fit both sides over the trigger guard of the sub-compact handgun. Next, make sure it is aligned properly and tighten the screws. By then, you can load the batteries. An advantage to this one is you don’t need to detach the pistol light when changing batteries. Like all other Streamlight weapon lights featured in this article, the TLR-6 also uses C4 LED technology that can produce a beam that balances with peripheral illumination through the parabolic reflector. Though only at 100 lumens with a runtime of 1 hour, it’s bright enough to search a room or light the immediate vicinity up to 89 meters. Many of you might find 100 lumens to be not enough for a flashlight. Also, its runtime is one factor that you need to watch out when you buy TLR-6. At a runtime of 1 hour, most probably you will need to bring spare batteries. Furthermore, as evident from the runtime and construction among many other things, this pistol light is not for tactical use. The activation switch of the pistol light is a single button found on both sides near the rear. Pressing on either side will turn on the light. To change modes from laser only to light only to laser and light, hold down on the button and press the other button. The TLR-6 projects red laser of 640-660 nm direct drive and has a runtime of 11 hours. The laser is bright enough at nighttime and provides long-range visibility. It is also fully adjustable for windage and elevation. The pistol light has automatic shut off after 10 minutes in order to conserve the batteries. Aimkon HiLight P5S is the cheapest pistol light in this article and one of the cheapest weapon light to be found in the market. With its size and weight, it is definitely an accessory for smaller guns. It is bound to fit most sub-compact handguns with a rail. It comes with a quick detachable weaver mount. HiLight P5S is made out of lightweight aluminum which is both water and dust resistance. It can also survive drop tests of about 1 meter. The lens is shock-resistant and not prone to scratching, giving you a clear and obstructed light beam. This pistol light uses Cree XM-L2 LED technology with a brightness output of 400 lumens and a runtime of 45 minutes. The smooth reflector provides a wide beam that can reach several meters away. With the excessive lumens and the short runtime, this pistol light wouldn’t even reach 1 hour so it would be best not to use it for heavy duty tasks. The obvious setback for HiLight PS5 is its switch is not ambidextrous. Left-handed shooters will have to memorize to turn it on from the right. The main feature of HiLight P5S is its quick attaching and detaching system. As long as the gun has rail, you will only need to slide the pistol light from the front to attach it. It has a firm grip and will not wiggle. There are two modes that you can toggle through an activation switch: constant and strobe mode. To turn on the light, just press on the right side. The off function is the switch on the left. To switch to strobe mode, switch the light on from off mode quickly. To make the most out of your handgun and for safety, it’s best buy the best pistol light you can find. It’s not only compact and lightweight, you don’t need to hold one flashlight on one hand and the gun on the other, when you can combine both of them into one. © Copyright 2016 - The Survival Life. All Rights Reserved.